The Rhine is the artery carrying the lifeblood of the city, it provides recreation, inspiration and has moulded the history and architecture of the city. In the summer months Basel's inhabitants, students and businessmen flock to the river's banks to sunbath, promenade and generally let their cares melt away in the sunshine. Many also indulge in a special leisure activity that brings exceptional enjoyment - a swim in the Rhine. It is often said that the Mediterranean seems very close to the city, and If you mix with Basel's inhabitants you will soon discover why. Cross the river in the same way as it has been done for the last 150 years. Ring the bell on the landing pier and step aboard one of the four Rhine ferries, powered solely by the natural current of the river. You can take a dip in the Rhine at any time during the summer months, however the official Rhine swim takes place only once each year. Whether young or old or somewhere in between, thousands brave the waves and join the big swim event. The "Wickelfisch", a unique Basel invention, is a watertight sack that keeps your clothes dry whilst swimming. It costs CHF30 and is available from our tourist information centres. A special edition "Wickelfisch" from our summer competition last year is also available for purchase exclusively at the centres. The buvettes have become an established part of the Basel cityscape. They open up in fine weather to serve delicious drinks and snacks – perfect for relaxing. Only those that have ventured into the Rhine can truly understand the soul of the city. So it's off to one of the two Jugendstil bathing houses, bathing suit on and walk upriver. Then simply drift on the current until you are back to where you started from! 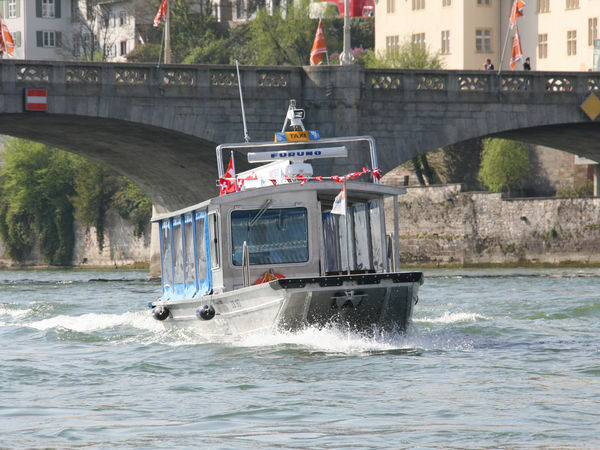 Basel can also be ideally explored from the water. For example, on board a Rhytaxi, which will take you from point A to point B. This is one not to miss! On board the white fleet of ships operated by the Rhine river cruise company you can explore the city and the surrounding region from the water and at the same time indulge in delicious culinary delights. On hot summer days, swimming in the Rhine is the most popular sport in Basel. Take a look at this great event on Google Street View.